Every time a card is played, the player adjusts the count according to this table. The count is then normalized by dividing by the number of decks remaining — if there’s only 1 deck remaining, a +5 count is a huge advantage, but if there are 5 decks remaining the advantage is typically small. 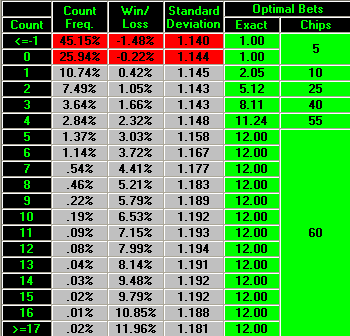 The player then uses this normalized count to adjust both his bet and his strategy to maximize his expected outcome. To adjust the strategy, the player basically needs to memorize a strategy table for each possible count. Alternatively, the player can use a strategy such as the Illustrious 18 to minimize the amount of memorization required while still enjoying most of the benefits of card counting. To adjust the bet, the player must first decide how aggressively he wants to play. You can maximize your potential winnings by increasing the ratio between your minimum bet and maximum bet, a number that is commonly referred to as the spread. There are two big downsides to playing with a high spread: it will draw attention to yourself, and it will introduce a lot of volatility into your bankroll, which makes a smaller spread more appealing to some players. At most tables, I would consider a 1-16x spread pretty aggressive and a 1-4x spread pretty conservative. One of my favorite blackjack simulation tools is CVCX. 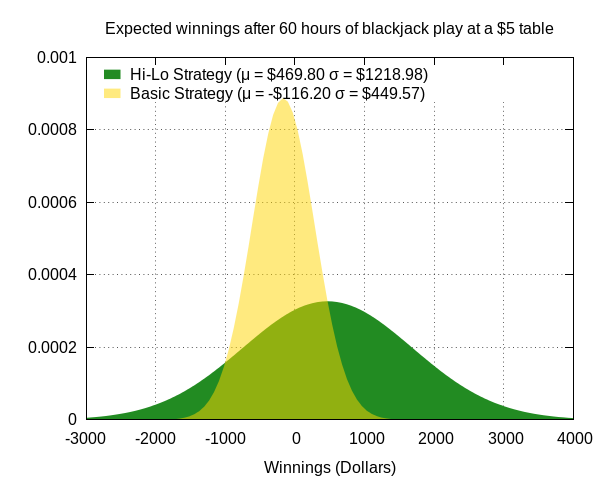 Below is a diagram that should give you a basic idea of how card counting can be profitable. For each count, the frequency of that count along with the player edge is provided. In addition, a 1-12x betting curve (optimized using the Kelly Criterion) is provided. Between the summer of 2010 and the spring of 2011, I did a lot of card counting. Initially, I loved it. It was challenging and exciting. Plus, I had a lot more cash lying around the house. However, over time I began to lose interest, so I basically quit. I think card counting can be a lot of fun and can be a great hobby, but doing it for purely economic reasons doesn’t make sense for reasons I intend to describe in this post. How much money can you make counting cards? With this set of rules, the player has a 1.3% advantage if the hi-lo counting system is applied perfectly with a 1-12x spread. 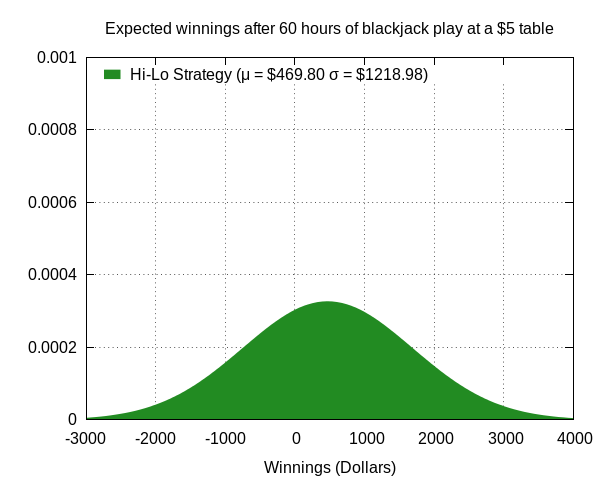 At a $5 table with the recommended betting curve, the player will have an average bet of $12.04. 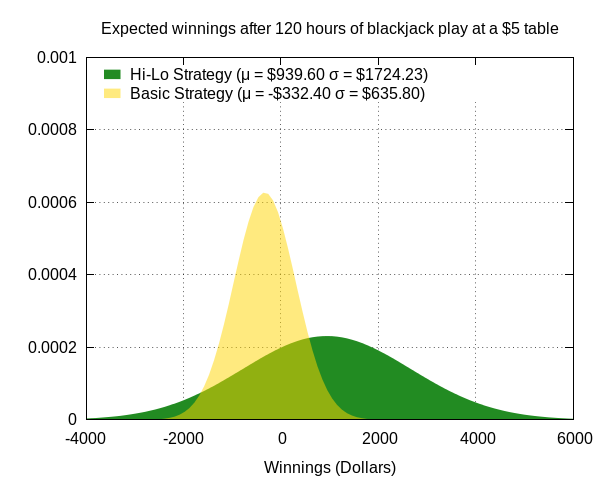 With these favorable rules, at 50 hands/hour the player can make a profit of $7.84/hour. You could also say that the player can make a profit of 1.57 units/hour, where the “unit” is the base betting unit. In our example, it is $5, and $5*1.57/hour = $7.84/hour. $7.84/hour is terrible. In many states, it is less than minimum wage. It might not be enough to pay for the gas it took to get to the casino. It’s worth noting that there are still steps a counter could take to improve his expected winnings. For example, he could play with a larger spread. He could play multiple hands when the count is good. He could use a more advanced counting system. He could take steps to play more hands per hour. He could perhaps place favorable side bets at his casino. These tactics can help, but they don’t fundamentally change the economics of card counting, so for the sake of simplicity, I won’t go into any further detail. How much money can you lose counting cards? Consider the following scenario: you decide to spend 2 hours per day playing blackjack at Mystic Lake for a month. You use the hi-lo counting system, and you don’t make any mistakes at all. How much money should you expect to make? As you can see, even if you play perfectly every day for a month, there’s still a very real possibility that you’ll lose a lot of money. In fact, the probability of you losing money overall is still roughly 35%. 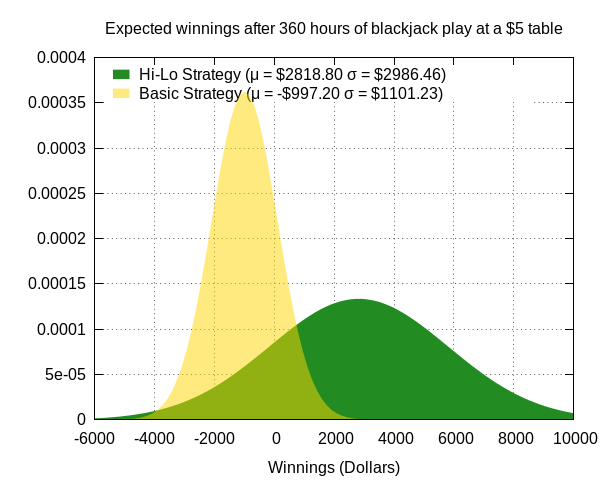 It’s interesting to note that even after 2 hours of play every day for a year, it’s still possible to be losing money, and it’s still possible to be worse-off than someone who is using just basic strategy, even if you play perfectly. Hopefully it is clear that the high variance associated with card counting strategies is a huge obstacle for card counters. Without spending hundreds or even thousands of hours at the blackjack table, the card counter runs the risk of incurring substantial losses. It’s even harder for novice counters, who have no way of knowing whether their results should be attributed to luck or skill. It also means that the counter needs a substantial bankroll. My favorite thing about this table is that it tells you the probability that a counter will have massive cumulative losses at some point. For example, at a $5 table, there is a 53.1% chance that a counter will be down at least $1000 at some point. Would you have the confidence to keep playing if you were down $1000? What if you were down $2500? There’s a 20.5% chance of that happening. Of course, the table also shows you how much risk is associated with playing blackjack with a given bankroll. In order to keep the risk of ruin under 0.5%, a bankroll of 1700 units is required. This, in turn, is enough to make 1.57 units/hour. The problem is quite obvious: if you have 1700 units that you can invest, 1.57 units/hour is probably not worth your time. For example, at a $5 table, 1700 units comes out to $8500. If someone has $8500 they are willing to set aside for blackjack, chances are they will value their time at more than $7.58/hour. Likewise, card counting might make sense for a lot of people if they were making $75.80/hour, but this requires the player to set aside $85,000 for blackjack, which is something very few people can afford to do. One way around this constraint is to start out at a smaller table, then build up your bankroll to the point where you can play at a larger table. Rinse, repeat, get rich. This can work, but it requires an enormous time commitment. 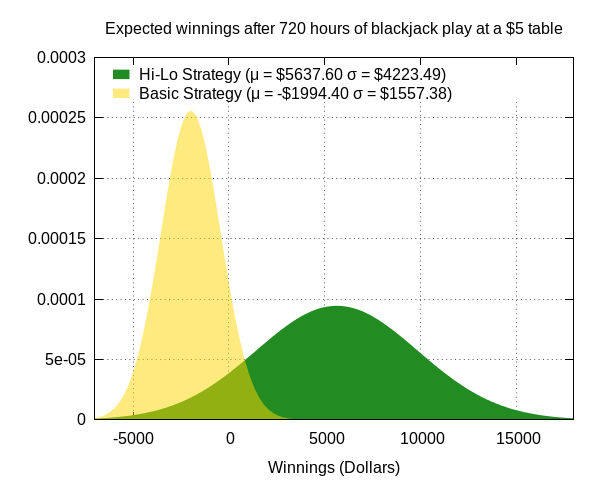 On average, it would take over 1082 hours to win 1700 units at a blackjack table. That’s over 6 months of playing blackjack full time, for free, since you’re reinvesting all of your winnings into your bankroll. That also ignores the opportunity costs and business expenses that an economically motivated card counter needs to account for. Every time you go to a casino to play blackjack, there are two major expenses that have not been taken into account yet. First, you need to somehow get to the casino. In the majority of cases, this will involve quite a bit of driving. This cost alone could wipe out your winnings. If you’re really frugal, maybe your casino has a bus that will pick you up. Second, there is an expectation that you tip the blackjack dealer, especially when you’re winning. It doesn’t have to be a lot, but it will likely end up being a substantial percentage of your expected winnings. Tipping is of course optional, but failure to tip would first be a pretty classless move, and it could also increase the amount of heat you get from casino management. If you’re having sustained success at the blackjack table, casino management is going to notice, and they can take steps to put an end to your success. This can be as simple as putting in a much faster dealer or having the pit boss strike up a conversation with you, but those tactics won’t stop a skilled counter. This has never happened to me, but apparently it is common for the pit boss to ask the dealer to reshuffle if the count gets good or to center cut the shoe. I’m also told some casinos will ask you to stop changing your bet, a tactic also known as flat betting. As I understand it, only in extreme circumstances will a player be asked to leave. Casino managment is not an insurmountable problem, especially at lower stakes, but it is certainly yet another obstacle to a profitable blackjack experience. In order for card counting to be a rational economic activity, a number of criteria must be met. First, the player must be willing to spend an enormous amount of time at the blackjack table — hundreds if not thousands of hours. The player must also be able to dedicate a massive bankroll to blackjack. With favorable rules, this bankroll should probably be at least 1000x higher than the player’s expected hourly payout. Even if these conditions are met and the player is able to successfully execute his strategy, there’s always the risk that casino management will catch on, especially at higher limits. It’s hard to imagine a scenario in which someone has both the talent and capital to successfully count cards, but can’t make substantially more money through a lower risk economic activity. Posted on December 31, 2013 by jsaxton. This entry was posted in Miscellaneous. Bookmark the permalink.